Podcamp Pittsburgh is a free social, new media un-conference that just completed its seventh year this past weekend. With local social media experts and celebs creating the content, no two years are ever the same. 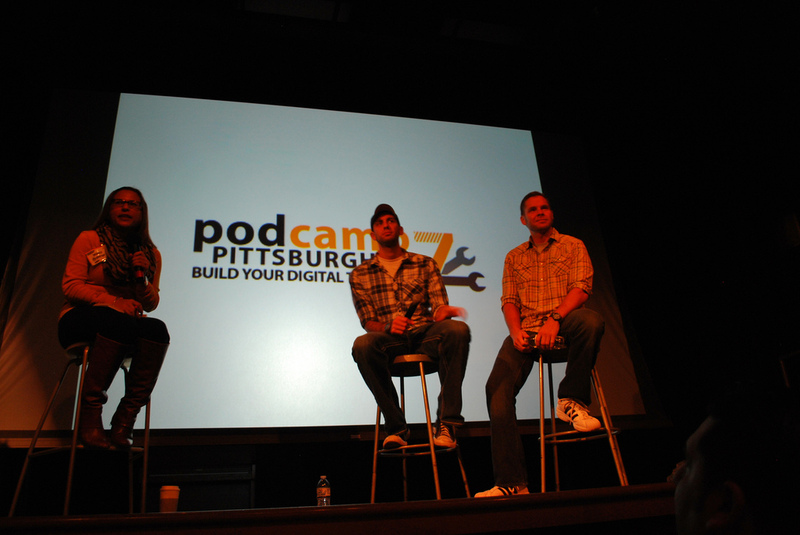 This was my second year attending Podcamp Pittsburgh. Despite the fact that waking up early on rainy Saturday AND Sunday is not my ideal fall weekend, I found it to be an incredibly valuable use of my time last year, and with the speed at which things change in the social space, I knew there was new information to be learned this year. In addition to learning a great deal about strategies and new tools in social media, it’s an incredible opportunity to meet the social media gurus of Pittsburgh, often people I’ve followed and “known” virtually for some time. Putting faces to Twitter handles is always fun! Because this conference isn’t arts specific or non-profit specific, I always find it interesting to take in the information wearing my different hats: as a social media manager for a non-profit arts organization, as a partner in a small for-profit business, and as an individual who is active online. Some might argue that these hats are very different and thus require very different information. For example, I attended a session entitled “Social Media for Nonprofits” and there were other sessions on the schedule called “How Crowdsourcing Can Drive Nonprofit Engagement” and “Using Social Media to Meet Immediate Nonprofit Needs.” After much thought, I am going against that grain and saying that I truly believe that social media for non-profits is just social media. Sure, programs, goals, and audiences are different, but that’s true from one non-profit to another and one for-profit to another. This doesn’t change the approach to social media strategy and usage. I believe this so much that I’m even considering proposing a session to that effect next year—stay tuned. Communicate value to your audience. Share information that is important to your audience. If you share valuable content, you establish yourself as an expert and the go to resource for information in your field. If you struggle with generating valuable content to share, you should not be jumping on every new media platform that arises. Show up. Having a profile on a social media platform that never gets updated is almost worse than not having a profile at all. Keep your information up to date and stay consistent. If you don’t have time to update 10 different platforms, pick the ones that suit your goals and your audience best and forget the rest. In true new media un-conference fashion, the sessions were streamed live throughout the weekend for folks to watch from home and they will all be available online within the next few weeks for anyone to check out. How do you use social media? Do you think it’s different for non-profits than everyone else?